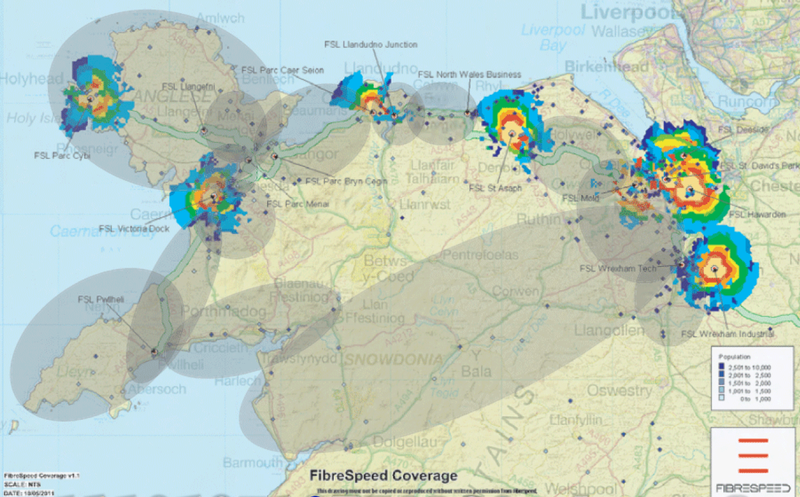 Fibrespeed’s potential coverage area back in 2012. Source: WAG. Maps showing that the Welsh Assembly Government’s (WAG) publicly-funded Superfast Cymru project supplied by BT will overbuild an existing publicly-funded network have led to questions about the legality of the £425m next generation broadband project. Using post code data obtained under the Freedom of Information Act with the help of the Information Commissioner’s Office, broadband consultant Richard Brown has identified post codes included in the Superfast Cymru roll-out that are already covered by the £30m Fibrespeed network. He has asked the European Commission to investigate whether there has been a breach of the regulations. BrokenTelephone reported in November last year that the WAG was seeking ways to overbuild Fibrespeed. At the time business, science and transport minister Edwina Hart said a change in the guidelines governing state aid for broadband might allow the overbuild, and promised to report back to WAG members. Fibrespeed is owned by the WAG but supplied and operated under a 15 year contract by independent dark fibre network operator Geo (sold last week to US-based Zayo). It was to service 14 business parks in north Wales with an optical fibre trunk network at prices equivalent to London and the UK South-East, according to assembly member Lesley Griffiths, speaking in 2008. Local ISPs tapped spare capacity in the network to provide local residents with wireless connections starting from 2Mbps, providing a service BT could not match. Brown asked Hart a year ago if Superfast Cymru would overbuild Fibrespeed. “At that time I received a statement from the business minister that she was satisfied that there was no overbuild, and the EU Commission received a similar reassurance that there was no overbuild and so chose not to pursue the matter any further,” he wrote to the commission. On receiving the post code data for Superfast Cymru coverage areas, he tested them against those covered by Fibrespeed (see table). “The original statement issued to me by the business minister, and subsequently affirmed by the EU Commission, was that the Fibrespeed project was specifically targeted at business parks in the north of Wales and, whilst resellers of the Fibrespeed capacity may have extended this network using alternative connection methods (wireless appears to be prevalent), no business park was to be covered by Superfast Cymru, and so no overbuild of the original public funded project would take place,” he said. Brown said, “It is clear that a deliberate attempt appears to have been made to misrepresent both the Fibrespeed and Superfast Cymru projects to the EU Commission for the purposes of securing additional (duplicated in part) public funding. *released postcodes refer to a document which is the 54k (approx) postcodes that the Information Commissioner compelled the Welsh Government department to release to Brown that detail the target intervention areas of the Superfast Cymru project. Openreach will always try to overbuild, primarily with public money if they can get a gullible council to fund them or if necessary with their own money. Competition has to be countered. That is why cities are usually faster than semi urban areas because Virgin operate there. We would all still be on dial up but for Virgin. Its good that at last someone else has got the facts and notified the EU who seem to live in a dream world. Surely they will act now? Digital Britain is a Superfarce. If public money went to altnets we would soon see BT stop pratting about with obsolete cabinets and FTTC. Competition is King. The Isle of Wight is another prime example of BT being given public subsidy to compete (Using one of the biggest mistakes humanity has made**) with the existing smaller incumbents who weren’t asking for funds but, quite properly, require to know what and where subsidised BT will “compete” with them. ** Dr Peter Cochrane, former BT CTO, to the HoL in 2012.
quite true Chris, councils are often woefully inadequate in the commercial sphere, which means Openreach can write its own agenda to accompany the blank cheque. It makes a complete farce of the state aid rules, the very rules we (Kijoma) were told many times prevented public servants from being allowed to be seen to promote or support our service over the years, let alone fund any of it. There didn’t seem to be any rules preventing them from obstructing , denying or defaming it though in order to serve a “BT” agenda. OX29 5BL and OX29 5AT are Thameside Court and Bablock Hythe in Oxfordshire. Gigaclear is building a fibre to the home network to both post codes funded by the operator and the tax payer. However, both post codes are included in Oxfordshire County Council’s contract with BT with work scheduled to be completed in 2015, according to the county’s map, which is subject to change. Whilst this appears to be two subsidies, BT’s contract requires 2mbps to all properties. Thameside Court and Bablock Hythe have less than 2mbps service so BT probably has to upgrade even though Gigaclear is using tax payer money to install fibre to the home. To further complicate it, Gigaclear’s connection and monthly charges were unaffordable according to surveys conducted on what people could pay for better broadband. Gigaclear is offering a 2mbps package exclusively to OX29 5BL and OX29 5AT for £20 a month (the amount people said they could afford) but there are still connection charges that some may find unaffordable. A 2mbps monthly charge from a supplier on BT Openreach platform is likely to be a few quid or possibly free with monthly line rental i.e cheaper than Gigaclear and no connection charge. Competition is king but my guess is for a few specific post codes, rules will quite sensibly allow some over build. Can you get BT’s service without paying £15.95 a month for a phone line? Ian, broadband prices from service providers on BT Openreach generally include line rental which, as you say, paid monthly is £15.95. Paying a year in advance if that is affordable is slightly cheaper. Taking £15.95 a month for line rental, to add 2mbps broadband prices are from £2.60 a month unlimited. Service providers run offers, paying line rental 12 months in advance plus unlimited broadband prices are less than £15 a month and no connection charge. Gigaclear speeds for OX29 5BL and OX29 5AT are capped at 2mbps costing £20 a month plus connection charges. Competition is good for consumers. The problem with rural broadband and competition is the market has failed, there is no competition. There will be post codes where circumstances throw up competitors which is good for consumers. Competition will probably lead to only one network surviving. Putting two networks into areas with few customers, or where peolpe have said budgets are limited, you have over capacity, two under used networks and only one will survive. Extending BT Openreach platform into rural areas is a better way in my view of ensuring competition of prices for consumers. a perfectly valid point Ian. We have people who moan we cannot offer broadband for a fiver etc.. We suggest they move their telephone away from BT to VoIP , then the cost is far less in aggregate. An increasing amount of people have taken this up and some businesses and schools who use Kijoma have taken up voip “wholesale”, saving themselves ludicrous amounts of line rentals. This is what i think BT fear the most at present, the loss of the one thing they can keep hiking the price of, line rental. An example here is our Home Light tariff is £13.99 a month, These customers then pay BT l £15.95 or similar for the privilege of what is often a muffly, crackly phone service. Total cost ~£30 a month! From this it is easy to use this to justify that Kijoma/Gigaclear or whoever are not cost competitive. However if the customer ditches BT and goes to VoIP then their “line rental” vanishes in many cases or at most is a couple of quid a month . Even at £2 a month, on top of £13.99 , their combined phone and Broadband is costing £15.99 a month. Is £15.99 a month excessive for combined Broadband and “line rental” ? Selna, you can’t get the cheap broadband packages on rural exchanges, there is no LLU. you have to pay lots more. Its all hidden in the hype. And if bt openreach would extend the networks into rural areas we wouldn’t be in this mess. They can’t do it, because it can only be done with fibre or wifi because of long line lengths. and there is no competition with one supplier, its just isps reselling the single product. Its a monopoly, and to get real competition we need altnets. Maybe some won’t survive, but having existed they will have brought about real infrastructure improvements instead of the silly patch ups currently wasting public money. Where altnets go, BT soon follow, and they follow with fibre, not copper. They wouldn’t do it if they weren’t seeking to prevent competition. Its a bit like David and Goliath. And the nation would love David to win. Patron saint of Wales. Chris, I put my phone line and post code into two cheap providers and I can buy the cheapest deals. I am rural, not included in 90% coverage. You do not argue the rest of your points factually. If you want to re-write them taking out the irrelevant bits designed to stop the argument being decided on facts please do so and I will reply. Selina, I will change that to ‘most rural exchanges’ then. Maybe yours is different from all ours and there is another provider in yours, or maybe its a big exchange near a rural area that has LLU. Most of ours do not do the ‘cheaper’ deals. They advertise £2.50 but the cheapest is actually £12.99 rising. Add the line rental to that and you will see it is all a big con. Anyone who sees through it and puts a bit more effort into a gigaclear or other connection will find that as their needs rise from the 2Mbps (which they will) then their connection will be able to have a simple upgrade. Unlike those stuck on old copper lines squeezing out the very most they can using bonding or expensive stop gaps, to no avail. Copper is obsolete. end of. It is not worth putting any public money into. It is a dead end, and eventually we’ll have to bite the bullet and recycle it all. We need fibre. Moral and optic. Fibre is the future, it can feed wifi and mobile as well, providing the ultimate solution. Keep patching up the rurals and it will never happen, we’ll become a third world country in the digital revolution. That is why BT is so determined to overbuild and crush budding networks. They need to retain their monopoly and leach more revenue from their existing assets. Stifling innovation and holding the country to ransom. The altnets haven’t really got a voice, but BT has a multimillion pound marketing budget and some very smooth talkers. The future has no lobbyists, but this blog will last as a lesson in our history books of how we tried. “We entered a competitive procurement process to bid for the grant-supported Northmoor project (http://www.gigaclear.com/gigaclear-wins-rcbf-funded-bid-to-provide-ultrafast-broadband-to-northmoor/). One of the requirements of the tender was to provide a basic low-cost internet access service. Our response, which subsequently won the competitive process, offered, as an additional option, a 2Mbps symmetric Internet connection contended at 25:1 and a fibre access line for £24 per month including VAT. Standard Home connection and installation charges apply. This specific product is ONLY available in the Northmoor service area. @Selina – you miss the point. Regardless of it’s relative desirability, overbuild (duplicate EU ERDF spend) is illegal. Welsh Gov appear to have created a situation where they find themselves having to prove something not to be happening, when there is documented evidence to the contrary. It’s not just a grey area. It has probably been written into the terms that some limited, at the edges, over build is allowed, unfortunately. it seems the BDUK process has circumvented this completely , not just the “edges” . Fortunately the law is like science, it still operates and exists whether you believe in in or not. There will be a significant crap storm from the public funded overbuild of commercial networks and rightly so in my view. Especially when it becomes clear that OR have spent the money overbuilding already served areas in deference to spending it on the areas where there is no service present. None of the parasitic providers via OR with their multitude of confusing deals have had to invest in the infrastructure but tey are surely still equally liable for the fallout though when they aggressively market their services over said illegal state funded infrastructure? If the Altnet network is mapped well, the post codes outlined and notified, then they will be excluded. The altnet also needs to pass a credibility test. But there is official way to amend the intervention area once set – see SA 33671 available online, It is bureaucratic box ticking in nature. However if there is any ambiguity then the areas are included. For instance C&W and Virginmedia may not have notified CC of their business fibre assets which is why money is finding its way to entrances to business parks. BT unlike France Telecom were not forced to publish their existing fibre assets, so you will notice from the NAO cost allocations (13% I think) for enabling core capacity. This charge, like the PM costs, the change control costs, the premiums for take up risk, and the USC premiums (which may not be spent unless someone asks for 2Mbps) were the means to explain a trebbling of the subsidy from c£15k a path to some £47k in the England and Scotland. 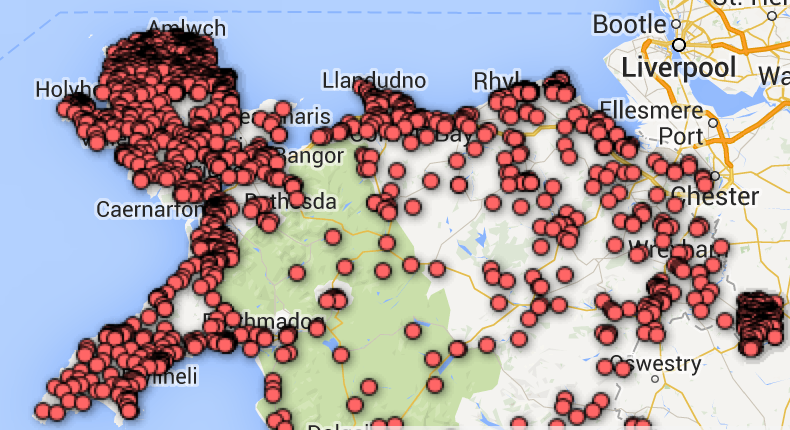 In Wales the subsidy is £205m/3000 cabinets – £68k each. Absolutely correct. Why hasn’t Selina addressed this? @Selina ” I put my phone line and post code into two cheap providers and I can buy the cheapest deals.”.. The website you visited says you can have them.. if you live in a non ADSL enabled exchange area it would say the same and BT retail regularly send their most recent “broadband deals” by post to properties their sister company has declined to service. This is part of the problem, false and misleading advertising.. Chris is right , a Market 1 exchange , of which there are many, excludes by default any LLU based deals like the ones headlined in the advertising blurb. The so called competition having a single infrastructure provider ..provides.. falls flat on its face if said infrastructure fails to provide due to its technical or cost limitations. Other genuine providers (i do not like the term Altnet) however have the technology and business model to fill that demand and this is what is being supressed. Would anybody agree the BDUK process should result in less Broadband coverage for the final 10% ? Strategic overbuild policy at OR will work to ensure this by pushing out the providers that already provide this service by distorting the market place and rendering the out reaches no longer viable to serve. Once this happens of course they will be ready, cap in hand, to receive more hand outs to resolve the situation they caused with expensive FTTP or similar in 5 or more years time. After all if the state will pay for it, they will fit it. I notice local public organisations near here are now firing up new “broadband campaigns” to resolver what the current BDUK funding does not , all of which are entirely aimed at an OR solution . They increasingly view “BT” as a public body and other providers such as Kijoma are referred to as “private suppliers” and with notable distain. well done BDUK/DCMS for giving the green light to commercial genocide ! Cunmor and Farmoor in Oxfordshire is part covered by Gigaclear FTTP with the other half of Cumnor currently an active project for GC to cover. BT have recently put in a statutory notice application to VWHDCouncil for upgrading the existing Cumnor/Farmoor cabinets to standard FTTC, and these post codes are due for completion in 2015 according to OCC’s BDUK website postcode search database. So no different to the rest of the UK…..
To add to the confusion OxCC are having a new OMR with a statement within it that they may call off additional BT coverage so goodness knows what is happening at the moment and whether the above will be true when the revised map is issued……. Altnets are no better than BT in wanting a total monopoly for THEIR service in the area. If they are putting cabinets in then its not a rural area as such. Real rural areas can’t be helped by cabinets, and those are the areas altnets need support (or at least not obstruction) to build. A real altnet doesn’t fear competition, as their service is far superior – we welcome competition, but not competition that is sold as ‘fibre broadband’ and ‘superfast’ which doesn’t do or isn’t what it purports to be. BT can effectively kill competition simply with words, and then they don’t deliver on their promises, but can cover it all up by their hype. They did that with the adsl coverage earlier in the previous decade. Ofcom said 99.8% of the uk had access to it, which is proving now to be a real porker. They will do the same with their rubbish FTTC. ‘Homes passed’ they call it now. CM7u, you probably know more than me, but I looked at Cumnor parish on OCC’s cabinet map. My guess is that post codes in 2014 is ‘superfast’ (slow compared to B4RN) off FTTC cabinet(s). The few post codes coloured for 2015 might be 2mbps from the county BT/contract but that seems odd, I don’t know the area though. Grey post codes which seem to be North Hinksey might be included in the BT/county contract as Vale of White Horse District Council has added £250,000 which attracts £250,000 match funding from BDUK to extend coverage in its district. “Altnets are no better than BT in wanting a total monopoly for THEIR service in the area.” Altnets want to service that area because BT can’t or won’t. CM7u obviously hasn’t read your previous posts about Dolphinholme? Now you may read this as them only being interested in an area where BT/BDUK are not or won’t be because there is a gap in the market. I read it as them only being interested in somewhere where no one else is now or ever will be in the foreseeable future thereby ensuring that their SFBB is the only one available for subscribers to purchase and they become the local monopoly. I can understand them not being interested in area which now has SFBB as people would be unlikely to switch – but that bit about ‘no future plans’ either is simply a attempt to ensure a lock in of profits for a substantial period. Frankly I don’t blame them to be honest – they need certainty of income over a period to back finance the costs of setting up the network in the first place. They ain’t stupid! Sure, as you say Altnets want to service that area because BT won’t – but only because they see they can make a profit there from the desperate residents. A hamlet of 150 in the middle of nowhere miles from some wretched roadside cabinet and which BT/BDUK have seemingly abandoned to their fate – sorry GC are not interested – no profit in it…. If the areas were profitable why doesn’t the incumbent do them? And why will the incumbent suddenly decide to do them once an altnet steps up to the mark? Gigaclear is plugging a gap that BT turned their noses up at. All gigaclear need to know is that the monopoly supplier won’t get funded to compete against their operation. Customers will always have a choice between a futureproof fibre and a clapped out copper phone line. Or mobile if it exists. Why would anyone want to choose a donkey if they have the chance of a jet plane? The reason that altnets don’t do areas that are publicised as already getting ‘superfast’ is that the mulitimillion pound marketing department of BT have convinced the public they will be ok and not have to do anything, so apathy reigns and altnets don’t waste their money trying to dispel the myths, they just move to areas where people aren’t so stupid and realise that they will never get superfast. Instead they get together and work hard and get real fibre hyperfast to an area. Kudos to all the altnets. Overbuild is proving quite common. Putting cabinets at the entrance to business parks with duct, private circuits and even C&W and Virginmedia presence is occurring. The Stae aid notification SA 33671 says rural 4 times. You hide a great deal behind confidentiality agreements. C&W/Vodafone will always pop up when there is a requirment for something that’s not a BT service. The price of there optical access and PRI ccts is a bargin compaired to the normal BT offering + excess engineering charges and the 120 day wait to provision service on most installs. If Virgin do a few business parks and get the fibre there they will soon start to harvest customers in the same way altnets are doing around the fringes. Then that will stop BT pratting about with obsolete copper and start building a proper fibre network. What we need is competition and a choice instead of a few ISPs fighting over scraps from the wholesale table. More tables. More suppliers. Real choice. Then ISPs will get a fair deal which they can then provide an NGA service from. Yes Bill, but as soon as VM decide to do something they jfdi, and then its too late for BT to catch up and if the area has Virgin, then its grey, so BT can’t get state aid. If Virgin is nimble enough they can avoid the dragon, or at least squirt water on its fiery breath. BT can’t move fast. Even a few simple villagers managed to lay fibre over many kilometres of rough land before BT could even bring a tiny bit through their existing infrastructure, that is how slow they are. BT spent 3 years assuring the village they would do it. In the end the pensioners picked up their spades and did it themselves. Took them 6 months. Virgin already have the staff, the plant, the money. They could easily clean up in rural and semi urban areas. Easy peasy. i quite agree.. however there is always the trump card, the dragon’s oxy acetylene so to speak.. just one phrase “Open access” . How are VM going to persuade all the ISP’s heavily dependent and some wholly dependent on OR to take up an open access service via VM? Assuming VM would offer such a beast? The primary reason the BDUK process was able to shut out other providers, regardless of their value or efficiency at resolving Broadband connectivity, was this phrase. Here is a quote from a written response from the then Broadband programme manager for WSCC Mike Hicks and the leader , Louise Goldsmith in 2010 in response to some questions i raised about the exclusion and blatant denial of an incumbent operator in the county. In my interpretation, I have taken that a not-spot is any location where there is no open access, reasonably priced service provided. I am aware that hard to reach and less commercially viable locations demand a premium from ISPs and the phrase “reasonably priced” would normally exclude bi-directional satellite, Ethernet (“leased line”) or synchronous services. Broadband speeds of less than 2Mbps should probably be included in the definition but I have created the phrase “not-a-lot spots” for those areas. In the case of the non-ADSL exchanges, I accept that Kijoma has coverage in those areas and that the prices are appropriate. However, a closed access service does make these locations, in my view, “not-spots” by the definition I am using. From this rational they wasted no time publicising these “not spots” via all the media. I have the recording of on of the radio shows on Radio Sussex where the Deputy head of the council was spouting the lie en mass. I would expect VM to be cautious about any long term projects with a significant RoI period , We certainly are. Part of me is sad for not living in the hills of west yourshire still – I’d have better access than I will ever get in London! Digging & community projects are good, but there is a lot of distraction to the rural when we have glaring issues in many citys & towns. Shorditch and ‘silicone round-a-bout’ which the gov love to make a big thing about; they are still stuck on adsl2, no virgin, no fttc even and bt have already said its not part of the 66% project. Your point is very valid, there is no money in providing FTTC/P in those locations. Which of course re-raises the so called separation of Openreach and Retail/Wholesale. Openreach “should” be impartial and be fitting it, regardless of the damage to other divisions leased line cash cows. Also why spend their revenue there when out in the sticks they are being funded.. it becomes a no brainer really.. spend money/lose money in cities/towns , not spend money/make money in rural areas..
Government really should keep out of the commercial sphere, al all levels they seem woefully inadequate at managing anything. Back to the original question of double funding in Wales. The Next Generation Broadband Wales (NGBW) is subject to independant scrutiny, which is a legal requirement of ERDF funding. If any transgression of the rules are found there is a mechanism for ‘claw back’ of public funding from the delivery organisation (e.g. BT-OR). This is already in progress. Two years after this blogpost was published, and just for an update… B4RN have now connected over 2000 properties with a gigabit symmetrical. In all their villages near main roads, openreach have installed two cabinets, a pcp for the phone lines and a so called ‘fibre’ cabinet for fttc. If this isn’t overbuilding then I don’t know what is. If any of these cabinets have been paid for with public money then its a scandal. If they are done privately then it is anti competitive behaviour. It really doesn’t matter to us, because they don’t have any customers, but it proves the point that if an altnet starts working then bt will find a way to try to stop them. Now customers in our area have a choice. And they choose well. Who in their right mind would pay a fortune for infinity which only works if you live near a cab when you can have 1000 times better for less money with an altnet? A commercial competitor is one thing all companies have to deal with invariably , however as you and I are both aware, this particular competitor has full backing from the public purse along with free marketing too. I can show you locations where they have extensively run FTTP at huge cost to small villages and hamlets in West Sussex, only for it to be largely unused and in some villages completely unused. The reasoning for this is there was “no broadband” there despite a now 11 year+ fixed wireless service. Ironically BT had declared these areas not even viable for ADSL in the past. So have now been rewarded out of the public purse for their failure. The county council who declared this of course are now trying very hard to push people to take it up as ultimately it is their job on the line if it is found out they effectively committed fraud. Meanwhile we are busy stealing phone customers too and in one village all the Broadband and telephone for every property is now connected to us. So redundant copper and fibre sits unused. I attended a meeting last Friday about vouches for broadband locally, they showed the areas eligible on a map and of course our service, covering over half the county is not shown. I raised the question about state funding being able to be used to allow a competitor to be paid to fit their service in areas we have already invested in and was promptly told to shut up by the guy running the panel. They of course will not be allowing applications from Openreach enabled or due to be enabled areas under the BDUK scheme. One of the points made is they do not mention other providers on their website etc.. Their reasoning is they are not allowed to do this as they might miss out a company blah blah etc.. They also claim they cannot promote any individual company or seen to be selective. It refers to “a select list of suppliers” , I might add Kijoma is not included and WSCC have made no attempt o engage with us in some years now. You will then see the gem of an ‘advert’ for a new wireless outfit based in Chichester who has a handful of customers in a small area. Like you maybe there, we are ostracised from the process and this is hardly surprising considering the sums of public money that have been mis-spent by these people. Their needs to be something done about this fiasco but where do you go when the media are not interested and the government sanctioned it. I don’t think you do anything Bill, it is a waste of time and energy, but it is worthwhile leaving comments on blogs like this, because it is the history book of the future and documents the whole digital britain superfarce from day one. All we have to do is keep supporting and building our altnets. At least our customers will have a good connection and not get ripped off for a pathetic meg on a good day. I should think Cumbria County Council should be able to say whether public money was used to pay BT to build its network. It should be easy to check too, against the maps of network build plans. I take your point that it doesn’t matter; it would be just for the record, and to ask councillors what has been the return on their investment of taxpayers’ money when the next election comes around.